Plants with leaves that float on the surface of the water and have their roots planted in the bottom are part of the category. Free-floating plants that derive their source of nutrients directly from the water are also included. The key component is that water is critical for the support of the plant or its leaves. Azolla or Mosquito Fern: Mosquito Fern or Azolla is a small free-floating fern approximately 1 to 3/8 inches wide. Leaves of the mosquito fern overlap giving a quilted look to the surface and hide the stem. A single root protrudes from each stem. Mosquito ferns can vary in color from green to red and are generally found in quiet ponds protected from wind action. Mosquito ferns can be aggressive invaders in quiet ponds and are often found mixed in with duckweeds or watermeal. If these fern colonies cover the surface of the water, then oxygen depletions and fish kills can occur. These plants should be controlled before they cover the entire surface of the pond. Duckweed: Common duckweed is a very small light green free-floating, seed bearing plant. Duckweed has 1 to 3 leaves, or fronds, of 1/16 to 1/8 inch in length. A single root (or root-hair) protrudes from each frond. Duckweeds tend to grow in dense colonies in quiet water, undisturbed by wave action. 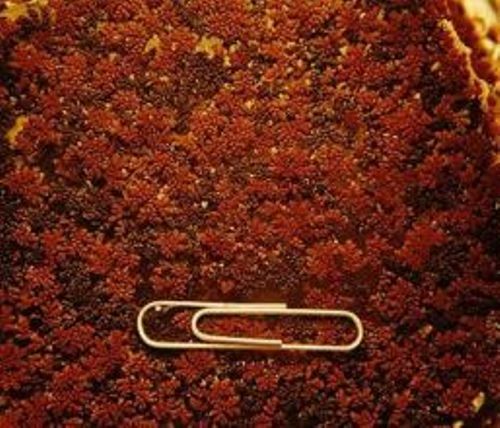 Often more than one species of duckweed will be associated together in these colonies. Duckweeds can be aggressive invaders of ponds and are often found mixed in with mosquito fern or watermeal. If colonies cover the surface of the water, then oxygen depletions and fish kills can occur. These plants should be controlled before they cover the entire surface of the pond. Common Salvinia: Common salvinia is native to South American. It is a small free-floating plant that grows in clusters and develops into dense, floating mats or colonies in quiet water, undisturbed by wave action. 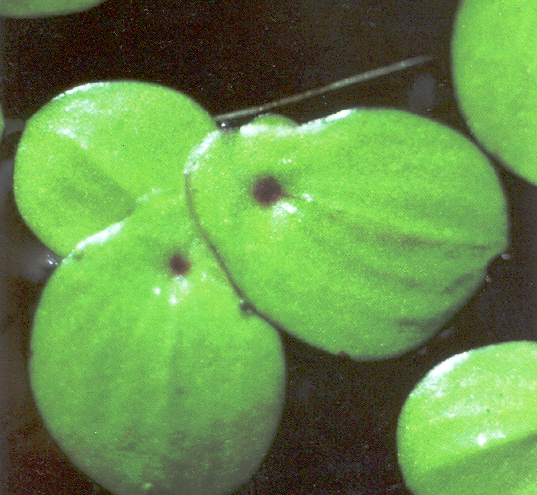 The floating leaves of salvinia are more or less round (1/2 to 3/4 inch) with a distinct midrib along which the leaf may fold forming a cup-shaped appearance. Salvinias have stiff leaf hairs on the upper surface of the leaves. In common salvinia the leaf hairs have a single stalk that divides into four separate branches. Underwater the leaves are modified into small root-like structures. The entire plant is only about 1 inch in depth. Salvinias are ferns and have no flower. 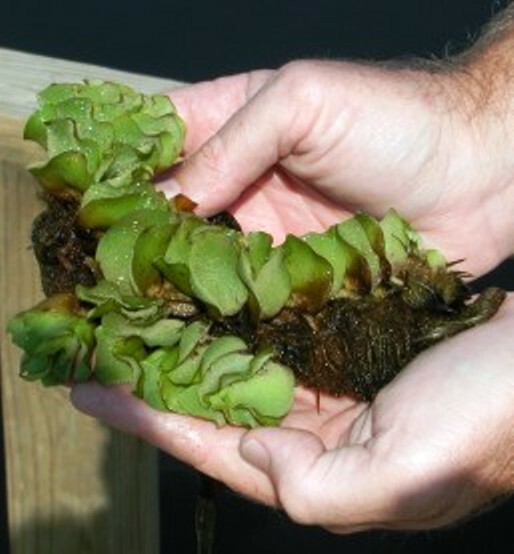 Common salvinia can reproduce by spores or by fragmentation and is an aggressive invader species. If colonies of common salvinia cover the surface of the water, then oxygen depletions and fish kills can occur. These plants should be controlled. TEXAS RESIDENTS: THIS PLANT IS NOT NATIVE TO NORTH AMERICA AND IT IS ILLEGAL TO POSSESS OR TRANSPORT THIS SPECIES IN TEXAS. PLEASE REPORT SIGHTINGS OF THIS PLANT TO THE TEXAS PARK AND WILDLIFE DEPARTMENT. Those outside of Texas should check with their own state to see if similar restrictions apply. Giant Salvinia: Giant salvinia is native to South American. It is a small free-floating plant that grows in clusters and develops into dense, floating mats or colonies in quiet water, undisturbed by wave action. 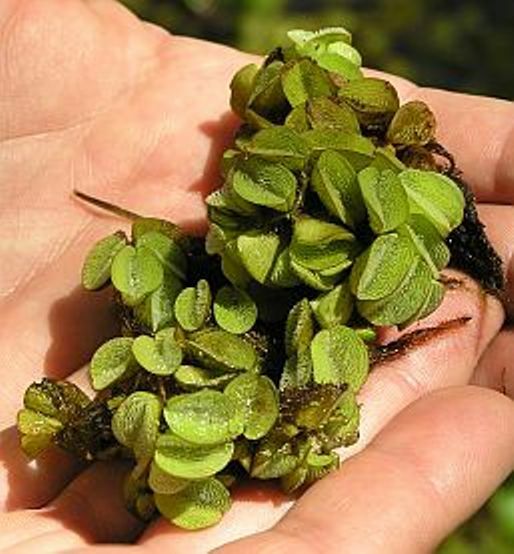 The floating leaves of giant salvinia are oblong (0.5 to 1.5 inches long) with a distinct midrib along which the leaf may fold forming a compressed chain-like appearance. Salvinias have stiff leaf hairs on the upper surface of the leaves. In giant salvinia the leaf hairs have a single stalk that divides into four branches that reconnect at the tip, giving the hair a cage-like or egg-beater appearance. Underwater the leaves are modified into small root-like structures. The entire plant is only about 1 to 2 inch in depth. Salvinias are ferns and have no flower. 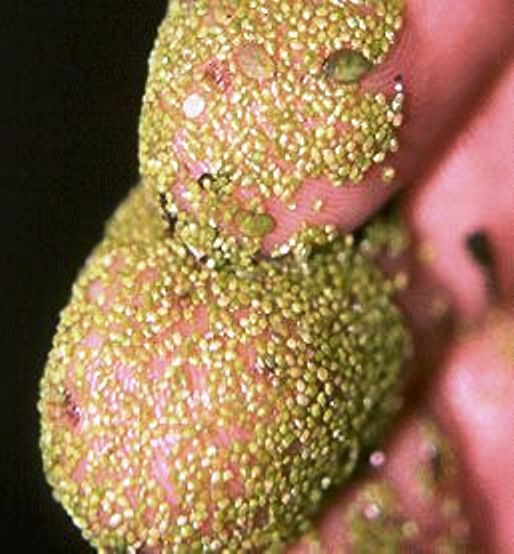 Giant salvinia has sporangia but are thought to reproduce only by fragmentation. Giant salvinia can double in size in 4 to 10 days under good conditions. Giant salvinia is an aggressive invader species. If colonies of giant salvinia cover the surface of the water, then oxygen depletions and fish kills can occur. These plants should be controlled. Bladderwort: True free-floating bladderworts are annual plants that lack roots but have flowers on erect stems above the water. 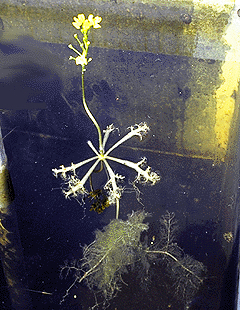 The entire floating plant is only about 8 inches tall. Flowers emerge above the surface and are yellowish with 3-lobes and a spur underneath. Underwater the leaf branches or petioles are fleshy and inflated with air which allows them to float. Leaves are whorled with 4 to 10 lateral leaves which fork often giving them a very delicate capillary appearance. Bladderworts are unique in that the underwater leaves bear small oval “bladders” that trap and digest small aquatic creatures. Bladderworts are usually found in quiet shallow, acidic waters and can form dense mats. Water Lettuce: Water lettuce is a free-floating plant with many spongy, dusty green simple leaves. The leaves are covered in very fine hairs and arranged in a spiral pattern from the center of the plant. The leaves are 1 to 6 inches wide and have large veins running their length. The flowers are seldom seen. 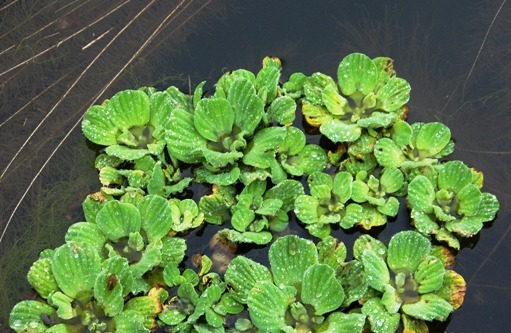 Water lettuce is a very aggressive invader and can form thick floating mats. If these mats cover the entire surface of the pond they can cause oxygen depletions and fish kills. Water lettuce should be controlled so they do not cover the entire pond. Waterhyacinth: Water hyacinth is native to South America but has naturalized much of the Southern U.S.
Water hyacinth is a free-floating perennial plant that can grow to a height of 3 feet. The dark green leave blades are circular to elliptical in shape attached to a spongy, inflated petiole. Underneath the water is a thick, heavily branched, dark fibrous root system. 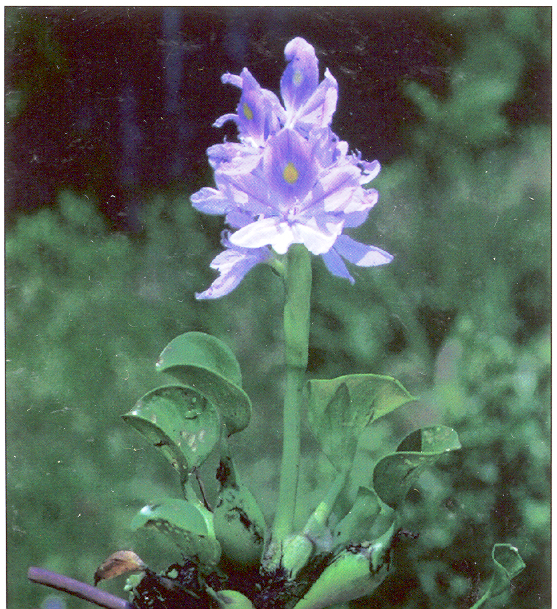 The water hyacinth has striking light blue to violet flowers located on a terminal spike. Water hyacinth is a very aggressive invader and can form thick mats. If these mats cover the entire surface of the pond they can cause oxygen depletions and fish kills. Water hyacinths should be controlled so they do not cover the entire pond. Watermeal: Watermeal is a very tiny (less than 1 millimeter) light green free-floating, rootless plant. In fact, watermeals are the smallest seed-bearing plants in the world,. Watermeal tend to grow in dense colonies in quiet water, undisturbed by wave action. Often watermeal will be associated with colonies of duckweeds. Watermeal can be an aggressive invader of ponds and are often found mixed in with duckweeds or mosquito fern. If colonies cover the surface of the water, then oxygen depletions and fish kills can occur. These plants should be controlled before they cover the entire surface of the pond. Dense colonies of watermeal often can completely cover the surface of a pond and will cause dissolved oxygen depletions and fish kills These colonies will also eliminate submerged plants by blocking sunlight penetration. Watermeal is not known as an important food but many ducks may consume it and often transport it to other bodies of water.